The planets Mercury and Mars will be in close conjunction on the morning of April 19. Skywatchers set your alarm clocks: On Tuesday morning (April 19), Mercury will appear to have a close encounter with Mars. In reality, the two planets will actually be separated by about 161 million miles (259 million kilometers), but in Earth’s sky they will appear only 2 degrees (which is about four moon widths) apart. You'll need to be up just before the sun, around 6:30 a.m. local time, to see this rare sight. Mercury and Mars will appear very low in the eastern sky and will be difficult to see in morning twilight. You will need a very low eastern horizon, with few obstacles in the way. Small binoculars will be a big help in spotting the two tiny specks of light, but first make sure the sun is safely behind a hilltop or other obstruction, as in this sky map of Mars and Mercury. You can also use the much brighter planets Venus and Jupiter to locate Mercury and Mars. 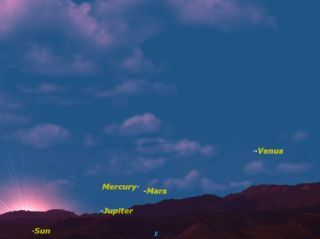 This is the first of a whole series of close encounters between six planets in the morning sky over the next two months. Saturn won’t participate in the dawn dance, since it is currently dominating the evening sky. Because of its rapid motion relative to the sun, Mercury manages two conjunctions each with both Venus and Mars. In addition, the waning crescent moon will pass through the gathering of planets in late April and again in late May. Neptune is the only dawn planet not to be involved in a conjunction, because it is too far to the west. These planet conjunctions offer many opportunities for beautiful photographs with ordinary cameras. Use your lens at its longest telephoto setting, underexpose slightly to bring out the colors of the dawn sky, and try to frame the planets with the silhouettes of foreground objects.